The main advantage of using ternary-blended concrete is to eliminate the drawbacks of the particular supplementary cementitious materials through combining with other superior quality material in order to reduce the overall cost of concrete production. It is also useful to enhance the structural properties of concrete. In this paper, fresh state and mechanical properties of self-compacting concrete (SCC) with binary and ternary cementitious blends of metakaolin (MK) and fly ash (FA) were evaluated and their inter-relationships discussed. For this purpose, different mixtures were prepared with different amounts of MK and FA by substituting ordinary Portland cement (OPC) by 5% to 40% of MK or FA. As a result of increasing the percentage of MK, FA and MK+FA, the mechanical properties of SCC improved considerably. It was found that the specimen incorporating the ternary blend of cement with 15% MK and 15% FA showed better workability and mechanical properties than that of the normal SCC specimen without MK or FA. This blend was proved to be the optimum combination for achieving maximum synergic effect. Self-compacting concrete (SCC) was first developed in 1988 in Japan due to the gradual reduction of skilled labour in the construction industry. Okamura and Ouchi (2003) pointed out that SCC can be achieved without segregation and high deformability in the following three ways, i.e. limiting aggregate content, low water:binder ratio and the use of superplasticiser. Nowadays SCC is gaining popularity throughout the world because of its interesting structural properties. Sood et al (2009) indicated that SCC is not accepted completely, due to its higher cost, and the lack of standard specifications and testing procedures; therefore it is mainly used for specialised applications. Recent results (Nor Atan & Hanizam Awang 2011) denoted that the reason for the increased cost of SCC production is the use of higher binder (cement) content which can be reduced by the use of various mineral admixtures, such as rice husk ash, fly ash, metakaolin, etc, as partial replacement of cement. Mineral admixtures can also improve the structural properties of the SCC. Metakaolin (MK) is an amorphous material that is obtained by dehydrating kaolin at a temperature of about 800°C. Khatib and Wild (1996) concluded that the high reactivity of MK with cement, and its ability to accelerate cement hydration, make it different from other pozzolanic materials. Shekarchi et al (2010) and Ambroise et al (1994) found that MK accelerates the initial setting time to attain high compressive strength at earlier age, and improves the mechanical and durability properties. FA is a commonly used pozzolanic material in blended cement and is a byproduct of coal-fired electric power plants (Chindaprasirt & Rukzon 2012). Yahia et al (1999) denoted that the use of fly ash in SCC enhances the transport properties, leads to higher later-age strength and reduces the micro cracks in SCC. Research results (Khurana & Saccone 2001) indicated that the replacement of cement by 30% fly ash can significantly improve fresh state properties. The use of fly ash reduces the demand for cement, fine fillers and sand, which are required in high quantities in SCC. Moreover, the incorporation of fly ash also reduces the need for viscosity-enhancing chemical admixtures. In this study, the effect of MK in combination with and without FA on fresh state and mechanical properties such as slump flow test, V-funnel test, L-box test, compres-sive strength, splitting tensile strength, ultrasonic pulse velocity (UPV) and dynamic modulus of elasticity were experimentally determined. Interrelationships of various measured mechanical properties are discussed in this paper. Ordinary Portland cement (OPC) conforming to Indian standard code IS 8112-1995 was used. The sieve analysis of fine aggregate (F.A) and coarse aggregate (C.A) was carried out in accordance with the IS 383:1970 code provision. The results of the sieve analysis, as well as physical properties of F.A and C.A, are presented in Table 1. Commercially available MK was used for this study and FA was obtained from the Tuticorin thermal power station, Tamilnadu state, India (conforming to IS 3812-1981). The physical and chemical analyses of OPC, MK and FA were carried out as per the relevant Indian standard (IS) code provisions. Superplasticisers (SPs) were used to increase the workability of SCC. For this work, a sulphonated naphthalene polymer-based SP with a specific gravity of 1.220-1.225 was used as a high-range water reducer (conforming to IS 9103-1999 and ASTM-C-494 Type 'F' depending on the dosages used) to improve the performance of SCC. The mix design, which was based on previous study (Sonebi 2004), was modified using EFNARC (2005) guidelines to produce M30-grade SCC without segregation and bleeding. For this study, seventeen SCC mixes (MK and FA ranging from 0%, 5%, 10%, 20% and 30%, and a combination of MK and FA ranging from 10%, 20%, 30% and 40% with one normal SCC) were prepared with a water to binder (W/C+MK or FA or MK+FA) ratio of 0.55 and 2% of superplasticiser. These mixes were designated as SCC (100% OPC) and SCC-MK05/FA05/MK05+FA05.......SCC-MK30/FA30/MK20+FA20. The mix proportions are presented in Table 2. The SCC was mixed with a concrete mixer for five minutes in a laboratory. For all mixes, three cube specimens of 100 mm size were cast for compressive strength testing, which were used for ultrasonic pulse velocity (UPV) testing before compressive strength testing. Three cylindrical specimens of 150 mm diameter and 300 mm height were also cast for determining the splitting tensile strength. After casting, all the specimens were left in the casting room for 24 hours. After 24 hours, the specimens were de-moulded and immersed in a water-curing tank up to the time of testing. To check the fresh state properties of SCC, slump flow test, V-funnel test at T5min and L-box tests were performed in the laboratory according to EFNARC (2005) specifications. 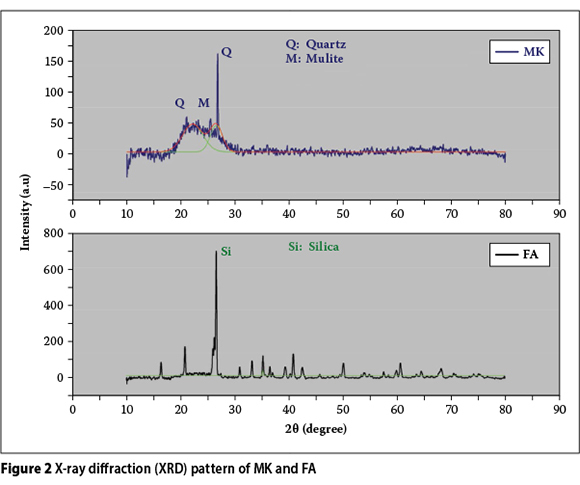 Mineralogical and particle size analyses of MK and FA were carried out by X-ray diffraction (XRD) analysis and particle distribution curve respectively. All the mechanical property tests were performed after 28 days of water curing. The compressive and splitting tensile strength test was carried out according to IS 9013-1997 and IS 5816-1999. Ultrasonic pulse velocity tests and dynamic modulus of elasticity tests were performed as per IS 13311(part 1)-1992 and the Poisson's ratio was taken as 0.24 (µ = 0.24). Physical and chemical properties of the OPC, MK and FA used are presented in Tables 3 and 4 respectively. Additionally, the particle size distribution curve for the binding materials is presented in Figure 1. 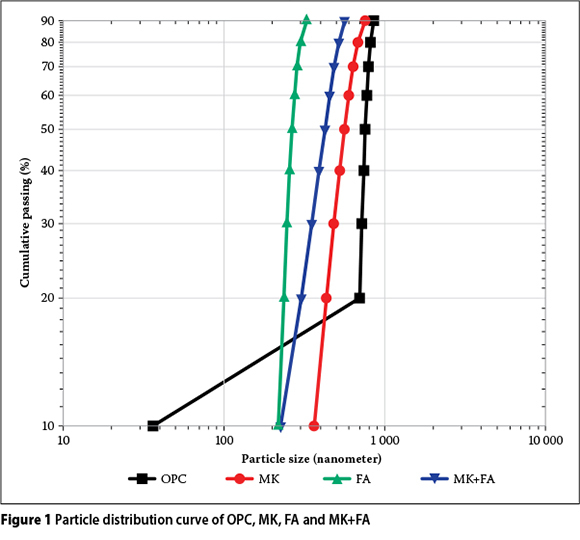 From the particle size distribution curve, it is noted that MK, FA and their combinations are finer than OPC, and lesser particle size was observed on FA. The fineness of the MK and FA may be the result of good pozzolanic reactions occurring in the cement. The XRD patterns of MK and FA used in this study are shown in Figure 2. From other references (Jutice & Kurtis 2007; Parande et al 2011) the FA was mainly in crystalline form, and MK in amorphous form, but it slightly deviated from amorphous forms to crystalline forms at an angle of 26.8092°, showing a high quartz and silica phase in the pozzolan. The fresh state properties of SCC containing MK, FA or a combination of MK and FA were studied and are presented in Table 5. From the results, the slump flow values for different concrete mixes were calculated in the range of 610-824 mm. According to values recommended by EFNARC (2005) for fresh state properties of SCC as presented in Table 6, all the mixtures examined fall under the categories of slump flow classes 1, 2 and 3 (SF1, SF2 and SF3). These classes in concrete mixes are used to indicate that these mixes are suitable for applications such as deep foundation construction (SF1) and for normal applications such as the building of columns, deep beams, etc (SF2 and SF3). From the results, it is clear that the slump flow (or filling ability) value gradually reduced with the increments of the replacement level of MK and MK+FA. This condition may be caused by the high reactivity and higher surface area of MK when compared to OPC and FA. It may also be due to the lowest fineness modulus of fine aggregate (FA) (see Table 1). Similar trends in the slump flow values were reported in Vejmelkova et al (2011), and in Guneyisi and Gesoglu (2008). The V-funnel times for different concrete mixes also appear in Table 5. From the results, it can be noted that the V-funnel times varied in the range of 3.9-7.9 seconds; all concrete mixes could be categorised into the VF1 class. According to the EFNARC (2005) guidelines, a V-funnel time exceeding 25 sec, is not recommended (Table 5). From the results, the V-funnel times for all concrete mixes satisfied this requirement. The L-box test results are also presented in Table 5. According to the results, the blocking ratio for different mixes varied from 0.59-1.00. A satisfactory blocking ratio was observed in up to 15% MK, 30% FA and 20% MK+FA mixes; the value of the ratio for the rest of the mixes was found to be outside the EFNARC-recommended values. Felekoglu et al (2007) concluded that a blocking ratio from 0.6-1.0 is acceptable for SCC to obtain satisfactory filling ability. In this regard, all concrete mixes were satisfactory (i.e. within the prescribed range), except for the 30% MK mix. In summary, all of the mixes exhibited satisfactory fresh state properties (according to the criteria established by EFNARC 2005 and Felekoglu et al 2007), except for the 30% MK mixes. 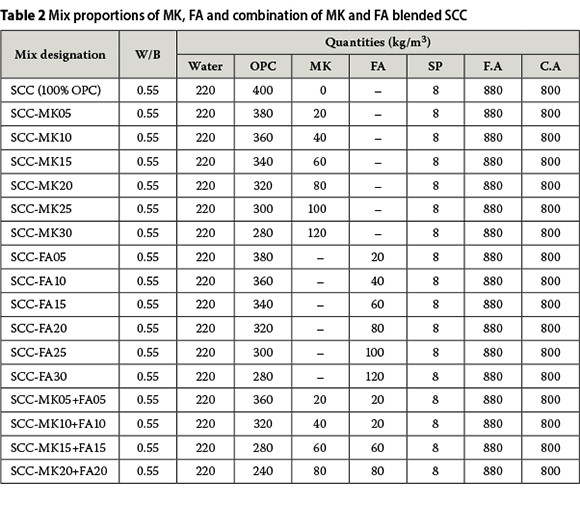 From the results it can be seen that SCC blended with MK and FA has a higher compressive strength than normal SCC (SCC with 100% OPC) (Figure 3). The strength improvement of SCC blended with MK deteriorates with age, a finding that is confirmed by Revilla et al (2006). The compressive strength of SCC blended with 15% FA was higher than that of normal SCC. However, the compressive strength of SCC decreased when the quantity of FA was greater than 20%. This may occur due to the increasing workability of the SCC blended with FA, because of the lower surface area of FA than MK, and its relative lower water demand. Presence of more Al2O3 in MK compared to FA further helps in sustaining this hardening process. A part of SiO2 in FA primarily reacted with CaO and supplemented the hardening process taking place in the MK+FA blended SCC. 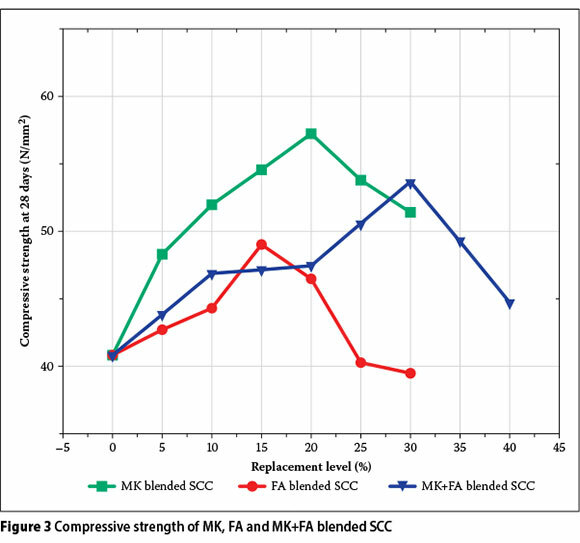 The above additional hardening process enhanced the early compressive strength in MK and MK+FA blended SCC. Recent results from Safiuddin et al (2010) and Shukla et al (2011) also led to similar conclusions. This demonstrates the benefit of using FA in combination with MK to produce SCC with a higher cement replacement of around 40% (20% MK + 20% FA). A comparison of the results shows that the compressive strengths improved up to 20% with MK, up to 15% with FA and up to 30% with MK+FA. As compressive strength, the 28-day splitting tensile strengths of the binary and ternary mixtures were generally higher than those of normal SCC mixtures, except for 30% of the FA mixture. 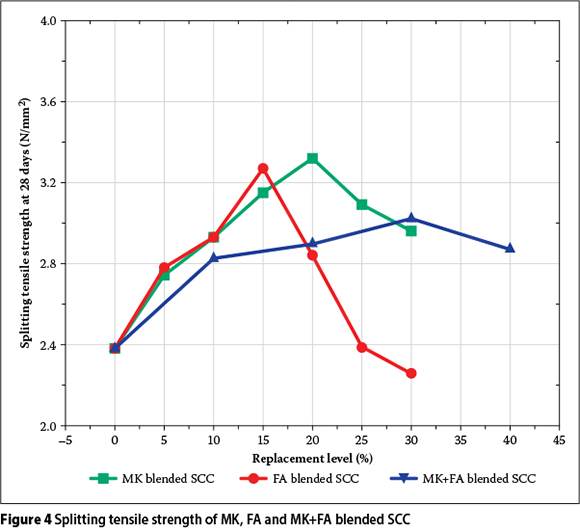 The utilisation of MK and FA in combination resulted in a better contribution to the splitting tensile strength of SCC than other mixtures. Although the range of variations in splitting tensile strength of SCCs was not so wide, there was a noticeable distinction in the strength values due to the inclusion of MK, as well as MK+FA. As seen in the compres-sive strength development at 28 days, the highest splitting tensile strengths were obtained at 20% and 30% replacement levels of MK (binary system) and MK+FA (ternary system) respectively. From this discussion it is noted that the replacement level, as well as the splitting tensile strength, can be improved through the ternary systems. It is also used to indicate the good synergic effects occurring between MK and FA. The normal SCC exhibits a splitting tensile strength of 2.38 MPa at 28 days of curing. The equivalent splitting tensile strength values for binary and ternary systems are obtained at 25% FA; the MK blended mixtures showed that the splitting tensile values were higher than the normal SCC - up to 30% in the case of binary systems and 40% in the case of ternary systems. Therefore 25% FA, 30% MK and 40% RHA+MK are considered as the optimal limit (Figure 4). 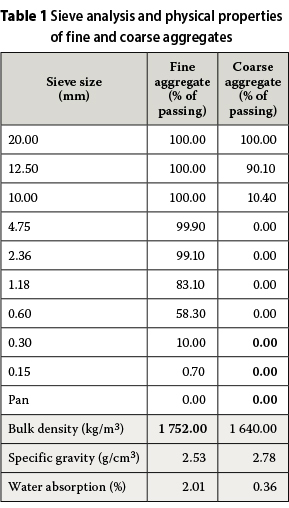 Ultrasonic pulse velocity (UPV) values for all the mixtures were measured before using the specimen for compressive strength test. 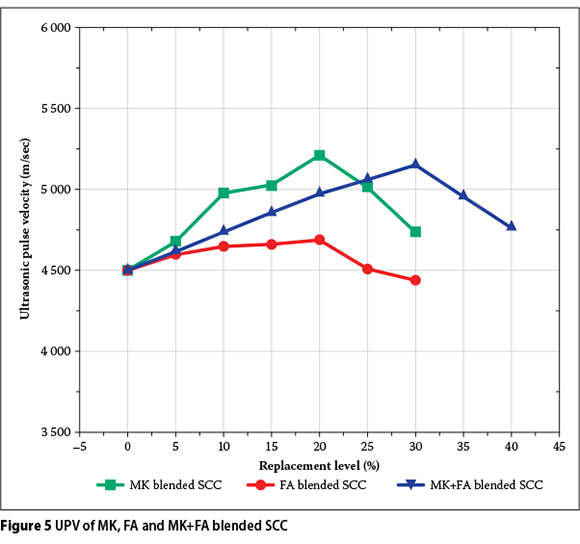 UPV values measured for MK, FA and combined blended SCC specimens are presented in Figure 5. It was observed that, compared with normal SCC (100% OPC), the UPV values increase due to the pozzolanic reaction of MK with Ca(OH)2 and the discontinuity of the porosity network due to the fineness and chemical properties of the material. The mixtures with a higher content of MK and MK+FA (with high amounts of alumina content) exhibited a much better resistance to ultrasonic wave penetration. From the results it was also noticed that the UPV values for all blended mixes were higher than for the unblended SCC, except 30% FA blended SCC. Breysse (2012) has also confirmed that the UPV of SCC with pozzolanic admixtures is higher than that of unblended SCC. Kaushik et al (1995) found that the ultrasonic pulse velocity was influenced by the properties of materials used in concrete, such as types of cement, types of aggregate, aggregate:cement ratio and water:cement ratio. Amongst all mixes, SCC with 20% MK + 20% FA cement replacement has been found to be optimum. As the compressive strength of concrete increases, the UPV also increases due to the denser internal structure of the concrete body. 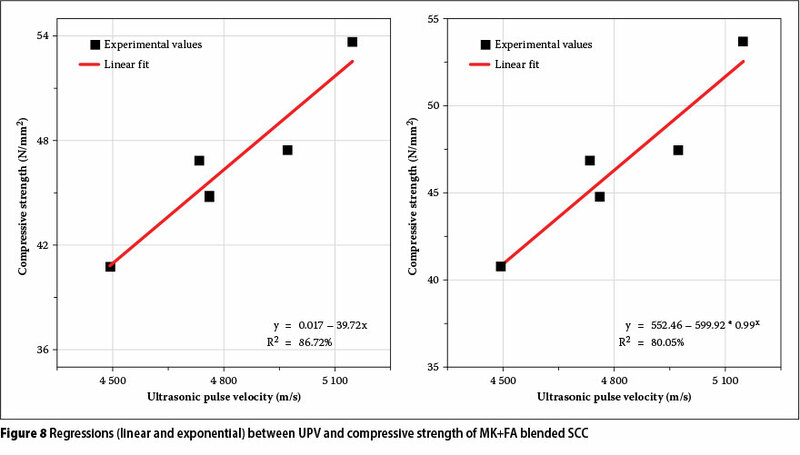 In the early stages, the gain rate of the compressive strength of MK-based SCC is higher, and hence the gain rate of UPV is faster than FA-blended SCC. In the case of binary-blended SCC with MK and FA, the UPV value is improved only up to 20% of MK, while considering the ternary-blended SCC, the replacement level of cement is increased up to 40% due to the good synergic and pozzolanic effects between MK and FA. When considering the quality of all mixes in terms of UPV values, IS 13311(part 1)-1992 gives the range of UPV rating for expressing the quality of concrete - for excellent quality of concrete the UPV shall be greater than 4 500 m/s; for good concrete the UPV shall be 3 500-4 500 m/s; for fair or medium concrete the UPV shall be 3 000-3 500 m/s, and for poor concrete UPV shall be less than 3 000 m/s. Figure 5 shows that all the binary- and ternary-blended mixes fall in the "Excellent" category, except unblended SCC and 30% FA-blended SCC. This implies the beneficial effect of MK and FA in binary- and ternary-blended systems on the mechanical property (UPV). where V is the ultrasound pulse velocity, ρ is the unit weight and µ is the dynamic Poisson's ratio of concrete. From a previous study (Weiss 2006), for calculating dynamic modulus of elasticity, the Poisson's ratios were assumed as 0.26 for substandard concretes, 0.23 for normal concretes, and 0.24 for this study. Shariq et al (2013) stated that the dynamic modulus of elasticity (DME) values are always closer to compressive strength and UPV values. Of several properties in concrete, the modulus of the elasticity of concrete is one of the most important parameters for the assessment of structural behaviour, and it was used as the input parameter for the structural analyses (Akcay 2004). The DME values calculated for MK, FA and the combined blended SCC specimens are presented in Figure 6. It can be seen that the DME increased with increasing percentage of MK up to 20%, FA up to 20% and the combination of MK and FA up to 30%. This improvement of DME is due to the fact that MK is finer than OPC and FA, and produces an additional calcium silicate hydrate (C-S-H) gel. In addition, MK blocks existing pores and alters pore structure - from a previous study (De Oliveira et al 2006) confirming that the addition of MK leads to a reduction in the pore space. It is also noted that the DME value for all the blended mixtures was higher than the unblended SCC. SEM images of unblended SCC (100% OPC), 20% MK, 15% FA and 15% MK+15% FA mixes are shown in Figure 7. From the SEM image in Figure 7(a), it can be observed that the unblended concrete sample consisted of irregular particles with micro pores, and this may be the main reason for the poor performance in relation to strength and durability compared to blended concretes. However, in the case of the SEM images of blended concrete with MK and FA (Figures 7b, c and d), it can be seen that the samples were not porous. Due to the hydration progress, the pore structure of the MK and FA blended concretes were greatly reduced, giving a more uniform structure than in the unblended SCC (Ramezanianpour & Bahrami Jovein 2012). The SEM image also shows that the ettringite (a spine-like crystal present in unblended SCC) is much reduced due to the pozzolanic reaction of MK and FA, as seen in Figure 7. Evaluation of the interrelationship between concrete properties is an important tool to ascertain concrete behaviour through known values. The UPV, as an indicator of structural behaviour of concrete, was chosen. Earlier studies (Neville 2005; Shariq et al 2010) demonstrated that there is no direct relationship between UPV and other mechanical properties of concrete. However, the UPV of concrete is affected by change in the hardened cement paste, which is influenced by the water:binder ratio. It has been noticed that the UPV wave travels faster through voids containing water compared to concrete with air-filled voids. In general, weaker concrete will be less dense and will therefore contain more water, which will affect the UPV results. Hence, it can be said that the UPV may also be affected by the wet condition of concrete. In the light of the above, the UPV test can be used to assess the strength of concrete. The water:binder ratio also affects the strength-related properties of concrete due to the addition of MK and FA in concrete mixes. Therefore, a relationship between the mechanical properties of concrete containing different percentages replacement of MK+FA and UPV has been established empirically based on the obtained results. The relationship (linear and exponential regression analysis) between UPV and other mechanical properties, such as the compressive strength (fc), splitting tensile strength (fe) and DME (Ed) of MK+FA blended SCC are shown in Figures 8, 9 and 10. From the regression analysis, a good correlation was observed between UPV and DME in both the linear and exponential fit. However, the relationship between splitting tensile strength and UPV showed a better correlation in exponential fit than in linear fit. It is indicated that the splitting tensile strength is somewhat varied non-linearly with UPV. The reason behind such a result may be that, since the ultrasonic test is conducted at low stress levels (Yıldırım & Sengul 2011), the test result values are not perfectly correlated with splitting tensile strength test values. In the overview, UPV is noticeably correlated with other mechanical properties (not less than R2 = 70%). This good correlation implies a beneficial synergistic effect of MK+FA replacement on different mechanically related properties. The synergic effect may have occurred because of the good packing behaviour of granular materials (MK and FA) in cement, as well as the cement hydration process. In previous studies (Detwiler & Mehta 1989) it was reported that the particle size of the pozzolanic materials may play an important role in the packing density of the concrete. Since the MK and FA particle size (see Figure 1) is less than that of cement, MK and FA can fill the cement particle gaps effectively. It should also be noted from a previous study by Vejmelkova et al (2011) that the synergic effect may have occurred due to the effect of the supplementary cementitious materials (MK and FA) on the cement hydration process. With the addition of FA to cement, the hydration is increased at a later stage, whereas in MK blended cement, hydration increases earlier than with FA. Therefore, the combination of MK and FA blended cement may increase the hydration at both the early and late stages. This indicates that the combination of MK and FA can have a good synergic effect on the mechanical strength properties of SCC (MK+FA have the advantages of earlier hydration than when using just FA-replacement, and is capable of yielding concrete with better properties at high replacement levels than FA-replacement or MK-replacement only). 1. The inclusion of metakaolin and fly ash in ternary blends with Portland cement positively contributes to improving the mechanical properties of SCC in terms of total quantity of replacement of OPC. The densification of the matrix brought about by the pozzolanic reactions of metakaolin and fly ash blocks the pores and results in increasing compressive strength, splitting tensile strength, UPV and DME. 2. Up to 40% of OPC (by weight) can be replaced with a combination of MK and FA without any adverse effect on the strength-related properties of SCC. 3. 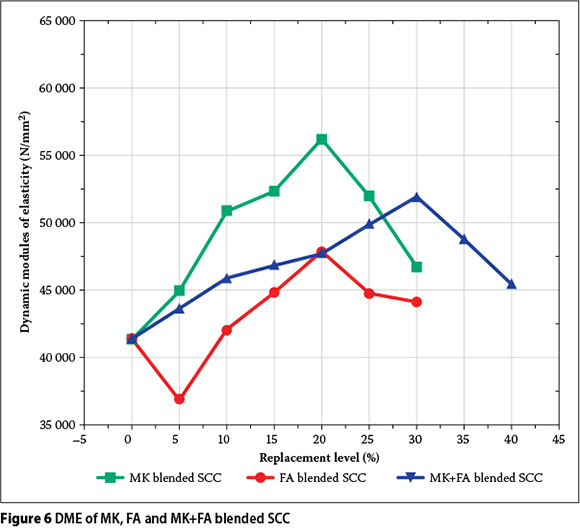 Replacement with 30% of MK+FA blended SCC mixes leads to improvement in fresh state and mechanical properties when compared to that of MK, FA and unblended SCC. The improvement is about 31.6% in compressive strength, 26.9% in splitting tensile strength and 25.6% in DME. 4. FA can be considered as a supplementary cementitious material for use in SCC. Although the addition does not significantly improve the mechanical properties, it can improve the workability properties compared to that of MK when increasing the replacement level up to about 30%. iii. R2 = 95.33% (linear) and R2 = 92.92% (exponential) for UPV and DME. 6. The SCC mix with 15% MK and 15% FA showed the best mechanical properties and it may be considered as beneficial limits of replacement for cement. V KANNAN is Associate Professor and Head of the Department of Civil Engineering at the National College of Engineering, Tirunelveli. He obtained his degree in Civil Engineering from the Indian Engineering College, Vadakkangulam, and his Masters in Structural Engineering from the Indian Engineering College, Anna University Chennai. Presently, he is busy with a PhD in Civil Engineering at Anna University Chennai. His main research interests are fresh and hardened properties of self-compacting concrete, chemical interaction among concrete properties, hydration rate of cement, and waste materials for concrete. PROF DR K GANESAN, who is Principal of the Sudharsan Engineering College, is a civil engineering graduate from the Thiagaraja College of Engineering, Madurai (1977). He completed his PG in GCT Coimbatore in the year 1981, and his PhD (Civil) in 2009. His teaching and research interests are in structural analysis and construction materials. He supervises a number of PhD students, and has published in many international journals dealing with construction materials. He is also involved with civil engineering consultancy work in and around Tamilnadu.